Metro Lutheran | A town without churches? This spring, I received an invitation in the mail that gave me pause. The invitation was for a first birthday party, which in itself is not odd. I’m 31, and my friends and I are at that stage in life where lots of us have infants and toddlers. What caused me to stop and think — not judge mind you — was the day and time of the party-to-be: a Sunday morning. Our friend knew that my husband and I are pastors, so we probably wouldn’t be there. The thing is, she must have picked that time thinking the majority of the other invitees would be free. It would be no conflict for them, friends and couples our age, in their late 20s and early 30s, with young kids. They’d be available to go to a party on Sunday morning, and it wouldn’t even be weird. Church just isn’t in their week-to-week landscape. The point of the church is to make manifest the reign of God — not inside a brick building, but out there — to those who do mourn and cry and are in pain and who don’t know this Jesus. In seminary, as pastors-in-training, we were conditioned to continually ask one basic question about our faith communities: Who’s not at the table, and why? Where are people if they’re not at worship on Sunday? To say the religious landscape has changed since the ELCA was born 25 years ago seems self-evident. Fewer and fewer people are filling churches in general, so to have a town without them? It’s not impossible to conceptualize. There are plenty of things to do with a Sunday morning — an extra shift at work, catching up on sleep or chores, going to a soccer game or a birthday party! If you’re a church person (whatever that means) already, we’re at a moment that could be terrifying or exhilarating — depending on where you stand. Can we imagine a town without a church? Because when I read Revelation, that seems to be exactly what the author is doing. After 20 or so chapters of judgment, with too many monsters and metaphors to count, the New Jerusalem is envisioned descending to earth, the embodiment of God’s healing and hope for creation. The ruler of the city is this ironic Lamb, and New Jerusalem is perfect — in structure and provision — with its golden gates and river of life, fruit trees that never stop producing. All things are being made new in the New Jerusalem — but, unlike what we read in Ezekiel, in this city there is no temple. This has always struck me like Uptown in Minneapolis without a coffee shop or Green Bay without Lambeau Field. You would think, in God’s city there would be a house of God, right? Yet in this New Jerusalem, there is no temple. In John’s vision of God’s dream for the world, there is no church! For those who choose not to participate in a faith community, these passages could actually affirm their decision against church. They could hear this and say, “See, we’re onto something!” And that something could loosely be defined as that which would allow for a spiritual-and-not-religious, create-your-own system of meaning, I-don’t-need-to-go-to-church-to-be-a-Christian form of belief. It’s right there in the Bible, they could say. Isn’t it? The point of the church has never been to be church for its own sake. And yet, for the church nerds out there (which qualifies as anyone who has ever been to a synod assembly, or who knows what a synod is for that matter), this vision from Revelation could resound as a challenge and re-commissioning. There is no temple in Jerusalem because “The home of God is among mortals. He will dwell with them; they will be his peoples and God himself will be with them” (Revelation 21:3). In this re-commissioning of God’s people, the challenge could be to get out of the shadow of our buildings, to unhinge ourselves from quarter million dollar mortgages and creatively decline the job of keeping up historic real estate. The point of the church has never been to be church for its own sake. The point, as I understand it, is to make manifest the reign of God — not inside a brick building, but out there — to those who do mourn and cry and are in pain and who don’t know this Jesus. In the New Jerusalem — there is no church because the whole city is the “holy of holies,” where the divine presence is directly, intimately available — God with us, radically among us, through us. So I’ll stand up and say, I can and do imagine a town without a church — where there would be no fronts that God is confined to Sunday morning, or a physical address, or a particular denominational affiliation even. I’ll imagine a town without a church where believers need to gather — around the Lamb in sacrament and word — then can’t wait to get the heck out there and spread the love and grace of God. I’ll imagine a town without a church, yes, which is a most frightening, exhilarating prospect for anyone with a pension dependent on the pulpit! Yet God will be with us. God is good. God is alive and on the move. As scholar M. Eugene Boring put it, Revelation proclaims that God is making all things new — not all new things (Revelation, Interpretation: A Commentary for Teaching and Preaching, Louisville: John Knox Press, 1989). Thanks be to God that even rusty tools like us — a 25-year-old denomination like the ELCA — can be re-commissioned and sent out to do “God’s work, our hands.” We can love and bless this world. Not perfectly yet, but that’s why we have visions, out in front of us: A world without churches. Amen. 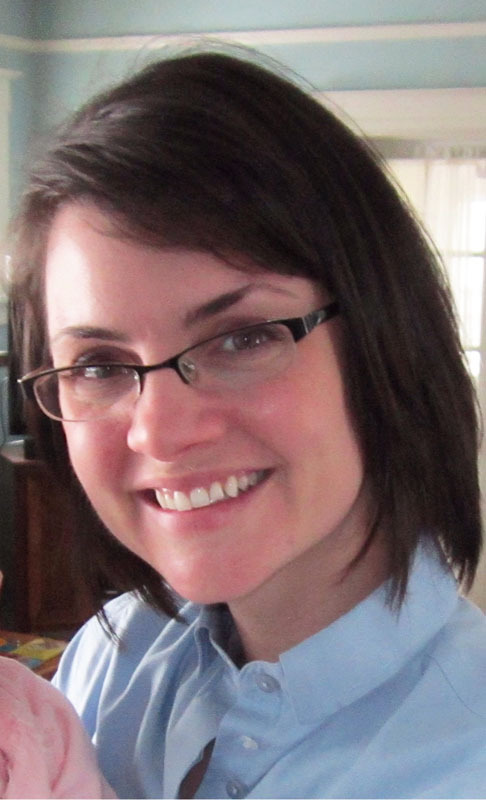 Sarah Semmler Smith’s home church is Peace Lutheran (ELCA) in New London, Minnesota, and she is a graduate of St. Olaf College, Northfield, Minnesota, and the Lutheran School of Theology at Chicago. She currently lives in Eau Claire, Wisconsin, with her husband Brahm Semmler Smith and their daughter, Meta, where she and Brahm serve as associate pastors at Trinity Lutheran Church (ELCA).